After Greg Cardenas graduated from Texas A&M with a degree in finance, he had no intention of going to graduate school, let alone becoming an attorney. But after spending a session in the Texas governor’s budget and planning office, law school sounded like a good idea. Cardenas shares with HE some of the other turns his professional path has taken on his way to executive vice president, secretary, and general counsel of USMD Holdings, Inc.
One of the most significant professional experiences I had as a lawyer was a case in which I represented executives charged with white-collar crimes. I was relatively young and green, but was given a unique opportunity to work on the case from beginning to end. In a criminal case, a person’s freedom is at stake. I believed completely in my clients. I felt like my job offered the very best of all worlds: sure, I was getting paid, but more importantly, I loved what I was doing, and I felt that what I was doing was right. This case went to trial, and I got married right in the middle of it—literally. I worked for two weeks, flew in, said my vows, flew out, and finished the trial. It was an early lesson in career sacrifice. I had great mentors as a young attorney and gained a great deal of confidence working on cases. I learned how to think on my feet, but I also learned to depend on and trust in others when I needed help or counsel. While trial work was intellectually challenging and exciting, I found it was hard to leave my work at work. Trial law is the kind of work you can never stop doing. As much as I loved it, I feared I would burn out if I spent my career in litigation. Looking for a change of pace, I transitioned to the health-care section at a large national law firm. Coming from a litigation background, I was used to confrontation with opposing counsel with my objective being to win at opposing counsel’s expense. What appealed to me about a transactional practice was that while I was still working with opposing counsel, the parties involved were usually trying to accomplish a mutually beneficial goal whether it be buying or selling a company, expanding operations raising money, or other business agreements. The spirit of cooperation was far less draining than the atmosphere of confrontation that is so often present in litigation. One of the partners I worked for gave me a very small transactional matter involving a very small physician group practice whose managing partner was a very entrepreneurial physician. I worked hard to do a good job for this client, so he would continue to call on me. The health-care industry is truly unique because the government pays for so much of it that there are industry-specific rules and regulations you don’t see anywhere else. During the 10 years I served as outside counsel to USMD, it was clear they were looking for someone to help navigate through the maze of rules and regulations, so I took it upon myself to become a health-care specialist. I left to start my own firm in 2004, but I continued to counsel USMD as its businesses expanded. I felt like a member of the team in every sense. I went on their company retreats and sat in all the board meetings. 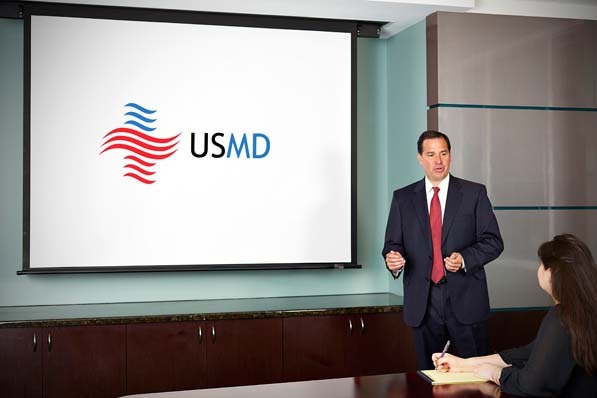 In 2011, I joined USMD as general counsel, and in September of 2012 we closed the transaction that created USMD Holdings, an innovative, doctor-owned integrated public health-care company. I didn’t know it at the time, but that managing partner physician I worked for 10 year earlier was a true visionary in health care. Today, he is my boss and the chairman and CEO of USMD. More than three years in the making, the creation of USMD Holdings is the single largest thing I’ve ever worked on and our largest team accomplishment. One of the most enjoyable aspects of being a general counsel that you don’t get at a large firm is the responsibility of being a businessperson as well. The strategic vision of the company is in the hands of a few leaders, but I offer input on how to accomplish our goals. The Affordable Care Act has made very clear to health-care providers across the country that integration is essential to long-term success. Evolution is a certainty, but in what form that occurs remains to be seen. What’s very clear is that the industry appears to be responding with vast consolidation, and I think USMD is uniquely positioned to offer physicians an opportunity to control their own destiny. There’s an energy level in our industry that I haven’t seen in 20 years, and we’re truly taking advantage of that.